Download or listen to this Radio Ecoshock show in CD Quality or Lo-Fi. Would you like a persistent source of short videos of hope, where people like you generate abundant food working with nature, rather than against her? Just get on Geoff Lawton‘s mailing list. He’s turned me on to permaculture do-ers who have ended up as guests on Radio Ecoshock. After writing books on permaculture, and teaching literally thousands of students, Lawton is among the few who have designed and guided major eco-restoration projects in many countries, including at the request of governments. In the last few years, he’s put out tons of videos (many free) and DVD courses for sale. His videos have made him famous. Here is a list of 200 of his videos on You tube! So it’s fitting that despite a belief in non-hierachical networking, Geoff Lawton give a first keynote speech at the 15th Annual International Permaculture Convergence, held in mid-September 2105, in London. A listener raised the point that Geoff did not mention, much less discuss, climate change in this keynote speech. That’s a shame, as permaculture has so much to offer in ways to capture carbon back into the soil, on a large scale. Geoff has been a regular on the Survival Podcast with Jack Spirko out of Texas. Spirko has denied that climate change is really a big threat to humanity. However, Lawton does talk about adapting to climate change in the Permaculture Designers’ Manual. There’s some ambivalence there. My other beef is that Lawton ends this talk with over-the-top optimism about the Eden that the permaculture revolution will bring. It’s too much roses and candy for me. I don’t think there will be a happy time to come, where permaculture solves all. It’s more a desperation move toward sanity, which may or may not take off. Even if it does, we are still in for very difficult times, which Lawton does not tell his audience. Sometime I’ll ask Geoff about all this. You can find a whole series of You tube videos of presentations at this Convergence on You tube here. Next up, Albert Bates interviews the Octagenarian permaculture activist, transplanted from Ireland to Germany, Declan Kennedy. Here is Declan’s page and bio at Gaia University. 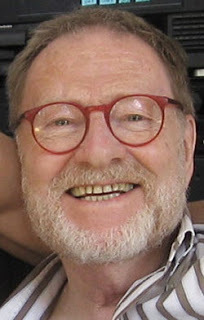 Albert is the author of books like “The Biochar Solution: Carbon Farming and Climate Change” and “The Post-Petroleum Survival Guide and Cookbook: Recipes for Changing Times”. He is the host of “The Great Change” blog at peaksurfer.blogspot.ca. Bates has lived at the iconic Tennessee intentional community “The Farm” for decades. While attending the Permaculture Convergence, Albert volunteered to interview some of the top permaculture leaders for Radio Ecoshock. Thank you so much Albert! If you are attending cool conferences, why not take along a good recording device. Think of all the air miles you’ve save me – and Radio Ecoshock listeners. Best to check with me first, using the contact form at my web site, ecoshock.org, or just write me: radio //at// ecoshock.org. Albert’s next guest is one of the long-serving leaders and communicators of Permaculture in the United Kingdon. 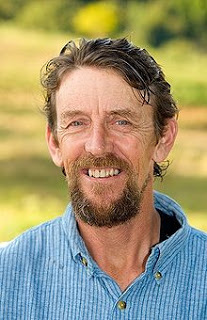 For many years, Andrew/Andy Goldring has been the Co-ordinator and CEO of the Permaculture Association in Britain since 1999. Andy Goldring is a driving force toward a greater international organization and wide-spread skill and knowledge sharing. Albert Bates contributes our last interview, this time with Andrew Millison, from Corvalis, Oregon. Let’s get this American perspective on the highs from the 15th International Permaculture Convergence in London, last September. Andrew Millison is a professional permacultural designer working out of Corvalis, Oregon. 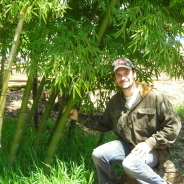 Find the website for Permaculture Design International here. ARE WE ON THE ROAD TO PERMACULTURE? It’s fair to say this world, our times, are suffering from growing pains. As a core project of our civilization and existence, we grow food in unsustainable ways, threatening the future, and destroying nature in the present. I’m convinced. In my little village plot, I have started down the road toward a culture than can last through the ages. What about you? One further note: please help pay the bills at Radio Ecoshock if you can. You can become one of my treasured supporters who pay $10 a month automatically via PayPal, or make a single donation of any amount. Get the details and easy buttons to click on this page. Thank you for listening to these alternative voices on Radio Ecoshock. And thank you for caring about our planet. Next week, I’ll be covering some very serious news about the climate, and troubles to come in our developing future. Stay tuned.